Procrastinate? Moi? – It’s TUESDAY…poetry, music, and another fun meme from Strawberry. – Ce Soir Arts – Be inspired tonight! Procrastinate? Moi? – It’s TUESDAY…poetry, music, and another fun meme from Strawberry. One of the reasons I am posting about this is that procrastination is a very common thing. Take my Aeon, for example. We recently enjoyed a week-long Spring Break, during which he did NOTHING (I mean NOTHING) until the last two days of the break, when he got all revved up and tore through a truly gargantuan list of things “to do.” I was amazed – literally amazed – at all he accomplished in such a short time. Wow, Aeon! He cleaned his gym room and reordered it; he worked with the tax guy and got that all settled for this year; he went SHOPPING (gasp!) and finally bought new shoes and boots – and the list goes on for both RL and SL. Thank you, Aeon…you sweet procrastinator, you! So…here’s the meme from Strawberry. I encourage you all to do it – blogger or not; it’s fun and informative. Where was the first place you made friends as a newb and got to know people in Second Life? Wow, it was Pulse Skins at the then-sim, Twisted Bliss. On my very first shopping trip, I met the wonderful Lorac Farella, a true artist, who helped me (and Aeon) learn the ropes of SL – and helped us explore the world of fashion as well as giving us a place to land. 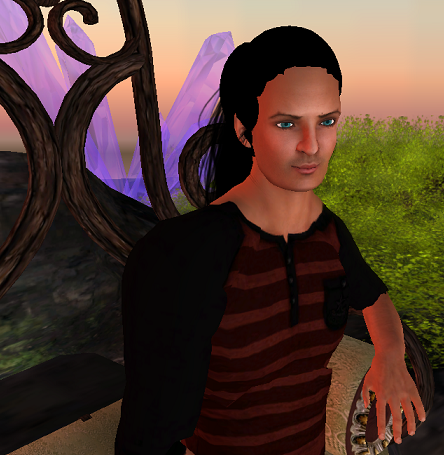 That was a magical time as we sat around the picnic table and swapped stories of our many adventures in the metaverse! They may have moved to a new sim, but we still visit- and shop! – there. Where do you spend most of your SL time now? Ce Soir – and Ce Soir Arts. We just redid the base sim to look be an estate in Provence. It’s amazing and I love it every bit as much as the spaces above; it’s HOME! Who is your closest friend in Second Life? (only pick one) Garvie! Garvie Garzo – the talented and amazing builder and creative force behind MeadowWorks. She helped me with the foundational ground textures for the venue – and a lot more – when Ce Soir Arts was first coming together. That was fun! What is the most favorite thing in your inventory? (only pick one) Hmmm – it’s either the BAX boots or the Marielle hair from Truth Hawks. The last thing you purchased in Second Life? An outfit from La Petite Details (LpD). It’s called Ella and I love it! What color clothing does your avatar wear most often? Red or black find their way into my colourful wardrobe. Do you prefer to walk, run or fly? DANCE! I prefer to dance. But for general getting about, I walk. What is the craziest thing you’ve ever done in SL? Well…my cousin is in SL too, and he is a bit devilish, now and again. We once went castle-shopping and (now, this is not very nice, so don’t think ill of me, please…) – whilst the castle that was rezzed and had several people in it, we, well, sort of derezzed it and made them go scrambling to the ground. I felt terrible! But it was daring. That was fun…and now, to stop the procrastination and work! It will all be fun, I assure you. Do come round to Ce Soir Arts today, as we have lovely poetry and music with the inimitable Russell Eponym at Noon – at The Magic Tree Reading Spot. Russell’s acumen and experience in the arts are truly expansive, and his repertoire includes literature as well as music and other genres within the fine arts. An erudite and learned man who has taught professionally, Russell will share his own verse as well as readings of other gifted writers. Known far and wide for his beautiful voice and sensibility, Russell will share today some specially-chosen poems that will charm and educate. Be inspired…tonight! Previous Busy times! Planning the RFL of SL Art Faire…guests in RL…etc. !